This illustration labeled regions of the human body show an anterior and posterior view of the body. facial region encompasses the lower half of the head beginning below the ears. The forehead is referred to as the frontal region. The eyes are referred to as the orbital or ocular region. The cheeks are referred to as the buccal region. The ears are referred to as the auricle or otic region. The nose is referred to as the nasal region. The mouth is referred to as the oral region. The chin is referred to as the mental region. The neck is referred to as the cervical region. the digital/phalangeal region encompassing the toes. The great toe is referred to as the hallux. the digital/phalangeal region encompassing the fingers. The thumb is referred to as the pollex. the lumbar region encompassing the lower back. the sacral region occurring at the end of the spine, directly above the buttocks. and the manual or manus region encompassing the back of the hand. the plantar region encompassing the sole of the foot. Some regions are combined into larger regions. These include the trunk, which is a combination of the thoracic, mammary, abdominal, naval, and coxal regions. The cephalic region is a combination of all of the head regions. The upper limb region is a combination of all of the arm regions. The lower limb region is a combination of all of the leg regions. 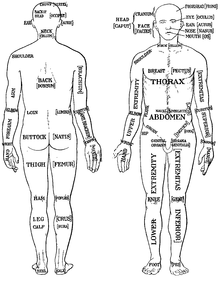 Older set of terminology shown in Parts of the Human Body: Posterior and Anterior View from the 1933 edition of Sir Henry Morris' Human Anatomy. Many of these terms are Latin terms that have fallen into disuse. ^ Still used to describe the head of a fetus.